Chris Baynes is a regular writer, speaker and radio commentator on the retirement sector and ageing. He has been very active in the international volunteer movement both in Australia and internationally. 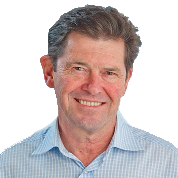 Chris has been a journalist and publisher in the retirement village and aged care sectors for 11 years. During this time, he has visited over 250 retirement villages and 50 aged care facilities both in Australia and overseas. Chris believes elders deserve respect and support, and are key to building a stronger and healthier community. “We need to engage in conversation, generate debate and ultimately take action, rather than being passengers”. His discovery that he was ‘no longer required’ followed by being identified as ‘unemployable’ due to age led him to establish DoComeMonday Media, which ‘Loves ageing’ and delivers the B2C and B2B 50+ markets around village communities and aged care. DoComeMonday Media publishes www.villages.com.au, www.agedcare101.com.au, www.thedonaldsonsisters.com.au and www.theweeeklysource.com.au. Linked enterprises include the McCrindle Baynes market research programs and the LEADERS SUMMIT events.